AVIVA Rental Systems carries mainly HP laptop and Dell desktop computers. AVIVA's current laptop inventory is comprised primarily of T-43, T-42, IBM (now Lenovo) ThinkPad laptop computers and Dell Latitude 630s laptops. If you are ready to place your laptop or computer rental order, call AVIVA Rental Systems at 804.353.9212 or toll free at 877-564-9143 or e-mail John Dunn at john@avivarentals.com today! With an Intel Pentium M CPU, running at 1.7GHz, and 2 MB of Level 2 cache coupled with 512MB of PC2700 DDR SDRAM the T-42 delivers the goods with a 60GB, 7,200 rpm hard drive, More than adequate for any applications you're likely to consider running on a notebook computer. AVIVA also carries a limited number of T-60s with Core 2 Duo processors. An Intel Core 2 Duo T5600 1.83 GHz processor and 2 GB DDR2 memory helps you breeze through applications. A roomy 100 GB hard drive provides plenty of storage space for music, games, videos, and other critical data. Availability is limited and if you require the parameters of a T60 for your laptop rental needs please call AVIVA as far in advance as possible of the rental period. Rent laptops, printers and copiers for your registration/check-in desk at your next conference or convention and save enough money to provide your conference attendees an Internet cafe (with laptops from AVIVA, of course) so they do not HAVE to lug around their laptops all day. Is your laptop, lost, stolen, broken or infected with malware? Or, maybe you just need to rent a laptop quickly!? AVIVA ships laptops overnight, anywhere in the continental United States! 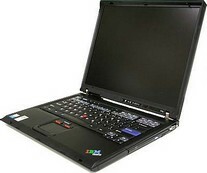 Call 877.564.9143 or click here for more details about an overnight shipment of a laptop. AVIVA also specializes in malware removal and can rent you a laptop while we remove infections from your laptop. Again, please note laptop selection is limited to availability, so please call as far in advance as possibleto reserve your preferred rental selection. Need to rent a laptop because yours needs repair? Perfect because AVIVA Rentals can assist you with your laptop repair issues as well. Planning a training session for your company? AVIVA Rentals can deliver all the desktop computers you require to your training facility and set them up with your software already pre-loaded. AVIVA's inventory of desktop computer rentals includes Dell Precision 380s and Dell Optiplex GX520s. Dell's Precision 380 workstation is based on an Intel Pentium 4 670 microprocessor that runs at 3.80GHz and features a 2MB L2 cache. The supporting chipset for the tested system is the Intel 955X chipset. The system includes 2GB of DDR2 533MHz 4-4-4 Dual Rank ECC RAM and a 160GB SATA 7200rpm hard drive with DataBurst cache. An NVIDIA FX3450 16x PCIe graphics card with 256MB of onboard memory provides the graphics for the Dell Precision 380 workstation. AVIVA Rental Systems stocks varying CPU speeds, chipsets, drives, and screen sizes. All of AVIVA Rental Systems laptops and desktops come equipped with the following: CD-ROM, monitor out, USB port, PS-2 port, Ethernet, phone and headphone jacks. "Aviva has provided my technical training seminars in Virginia with computer systems for 8+ years. These guys are always early to my events, they bring extra equipment, just in case, and generally have great, helpful attitudes!"